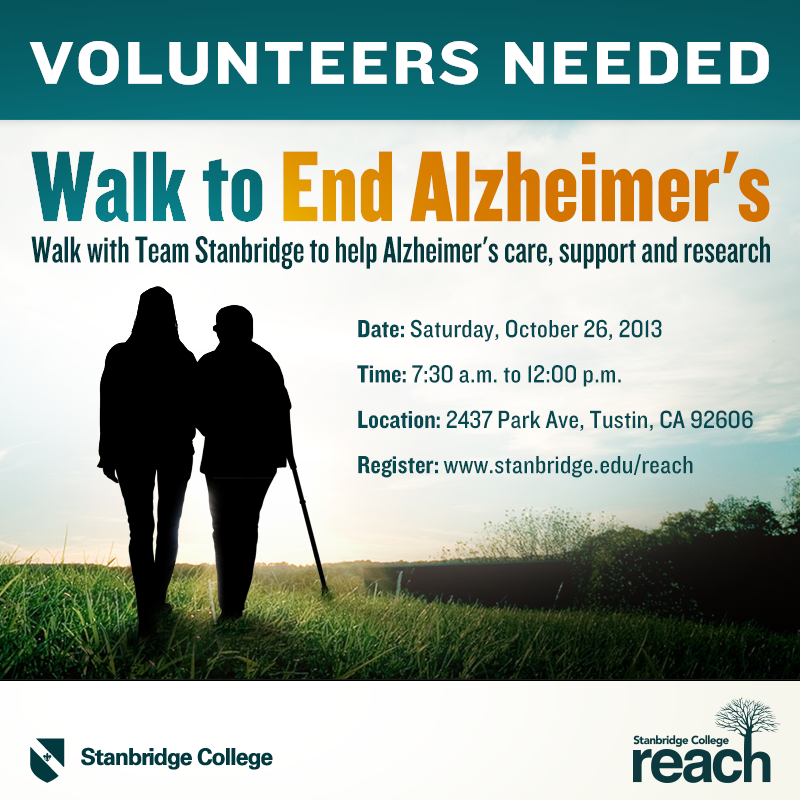 Stanbridge College REACH encourages you to join Team Stanbridge College and support the Alzheimer’s Association at the 2013 Walk to End Alzheimer’s™ at the District at Tustin on October 26, 2013. Alzheimer’s disease is the nation’s sixth leading cause of death. It is currently affecting over 5 million Americans and their families and loved ones. The Alzheimer’s Association Walk to End Alzheimer’s is the nation’s largest event to raise awareness and funds for Alzheimer’s care, support and research. Held annually in more than 600 communities nationwide, this inspiring event calls on participants of all ages and abilities to reclaim the future for millions. While there is no fee to register for this event, each participant is encouraged to fundraise as much they are able to in order to contribute to the cause and raise awareness. We encourage you to spread the word and invite your friends and family to join in on this important event for Alzheimer’s and dementia care awareness.